Partner compensation from hours billed will be governed in any firm by those metrics that define how the firm views itself and how work is done for clients. Such metrics could emphasize origination (percent of new business that the partner brings in), total hours worked, or hours assigned to other lawyers in the firm (a traditional hallmark of rainmakers). Some of these metrics will do more than others to increase, not only the partner's compensation, but the firm's revenue stream - which is, or should be, the ultimate goal. 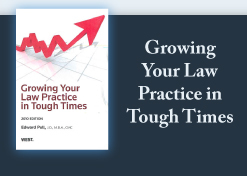 Any firm that encourages lawyers to maximize their individual compensation may have fast near-term growth. But a willingness to approach compensation as an institution makes for firm longevity. Take the example of a firm that wants to create the right environment for non-equity partners to become equity partners. Because compensation systems are a function of the firm culture and governance, firm leadership first must analyze what the goals of the firm are and ought to be. For any system to work, it must have the acceptance or "buy-in" of the principle stakeholders in the firm. Most systems will work so long as the participants deem the system in place to be fair and reasonable. Lawyers will accept less than the top compensation so long as they respect the compensation system that enables some colleagues to make more. The system is better, in my opinion, when there are objective metrics in place. Even subjective metrics work as long as the participants think there is fairness and justice working, with an appellate process in place that is also fair and just. When those elements are not present, problems inevitably result. For example, recent press reports discussed a female partner who claimed that her major law firm, one that has received awards for its diversity program, discriminates against women because women partners receive less compensation than men in the firm. The firm's partner distribution system is apparently based on origination, not just billable work. This is the case in many firms, and such systems were typically set up under "the old boy network" that existed in past years, when women were not major law firm players. This tends to entrench longstanding relations that male partners originated with (primarily) male clients as the basis for current compensation, allowing little or no access to women, to younger lawyers, and to other diverse groups of lawyers. Firms unwilling to look anew at their compensation culture will likely continue to face allegations of unfairness from within even as clients create greater pressure for diversity from without. Whether the relationship between law firms and their clients is a new one or one of long standing, every new matter involves the opportunity to establish more equitable compensation metrics that reward those who do the work as well as those who originated the client relationship. My head hurts! Technology changes are coming out of every pore in my body. In the last ten days, I got a new computer, faster and more powerful. I got new software - Windows 7, MS 2010, Corel 5, Dragon Naturally Speaking 11 ...and more. Also, I left the trial stage of social media. With the help of my West LegalEdcenter webcast (thank you Kevin O'Keefe and Heather Morse-Milligan) and the many discussions at the West Marketing Partners Forum in Phoenix this week about social media, I have moved into the transition stage. From here, I plan to move into the strategic stage. Wow! My head hurts from all that I've learned and the changes I now intend to implement from my new learning. But, as always, the journey starts with the first step. © 2011 LawBiz® Management. All rights reserved.